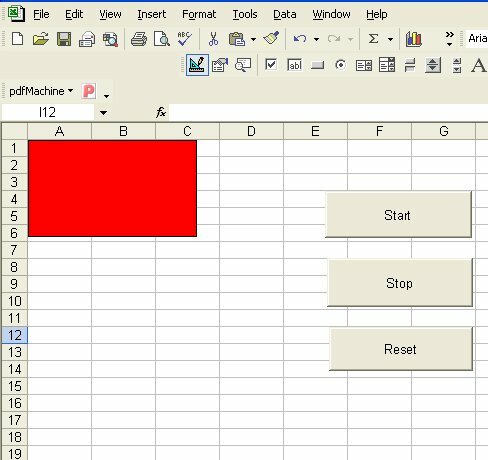 Besides creating an Excel VBA code for mathematical and financial calculations, it is also possible to create some fun applications in Excel VBA, including games and animation. Although professionals programmers might not be interested to write such applications, it is worthwhile trying them out as a hobby and for personal satisfaction. Animation can be achieved by changing the position of an object continuously using a looping sub procedure. Two properties or functions that are required to change the positions or coordinates of the object are the Left and Top properties. The Left property specifies the distance of the left edge of the object in pixel from the left border of the screen and the Top property specifies the distance of the top edge of the object from the top border of the screen. For example, the following code makes the object move from left to right then back to left again repeatedly until the user press the stop button. The reset button moves the object back to the starting position.